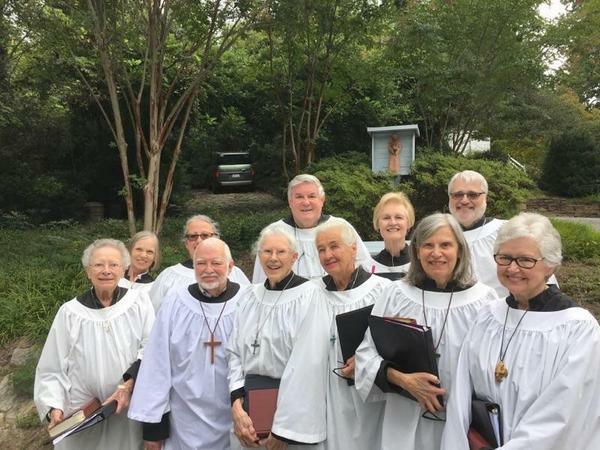 The ministry of the Transfiguration choir is to praise God by leading the congregation in their musical portions of the service (hymns and service music) and offering their gifts through anthems, chants or solos. This dedicated group of 11 singers rehearses on Thursdays at 4:30 pm and gathers on Sunday mornings at 9:45 to prepare the day’s music. They also sing for special services such as Christmas Eve, Ash Wednesday and Maundy Thursday. We are blessed to have talented leadership overseeing our music ministry as well as several guest musicians who participate in our worship. If you are interested in joining the choir or would like more information on our music ministry, please contact the Director of Music and Choir Director: Stephen Spence.